Squatting in a residential building in England and Wales becomes a criminal offence on Saturday, meaning squatters would face jail or a fine. Ministers said it would offer better protection for homeowners and "slam shut the door on squatters once and for all". The maximum penalty will be six months in jail, a £5,000 fine, or both. But campaigners warned the new law could criminalise vulnerable people and lead to an increase in rough sleeping. Currently squatting is treated as a civil matter and homeowners - including councils and housing associations - have to go to a civil court to prove the squatters have trespassed before they can be evicted. From 1 September it will be a criminal matter, and a homeowner can simply complain to the police who, if satisfied that the claim is genuine, can take action and arrest the squatters. The law also protects owners of vacant residential properties such as landlords, local authorities and second-home owners. The Ministry of Justice has issued guidance for police and other law enforcement agencies on the new offence. Police must prove that a person knowingly entered a building as a trespasser and "is living or intends to live" in it. Someone who falls behind with their rent or remains in a property at the end of a lease or tenancy would not be committing an offence under the new law. "Ultimately the government needs to tackle why homeless people squat in the first place by helping not punishing them” Leslie Morphy, Crisis. But the law will apply to existing squatters to "stop trespassers rushing to occupy residential buildings before the offence comes into force". Housing minister Grant Shapps said: "For too long, hardworking people have faced long legal battles to get their homes back from squatters, and repair bills reaching into the thousands when they finally leave. "No longer will there be so-called squatters' rights. Instead, from next week, we're tipping the scales of justice back in favour of the homeowner and making the law crystal clear: entering a property with the intention of squatting will be a criminal offence." Homeowner Hugh Whittle told the BBC he had returned from a stay in hospital to find squatters had moved into his property in London. "It was horrifying. Just going through the three or four months it took to get them out was a cost in stress. "And cost in money as well, of course... and the property did actually become worse in its condition which meant that we had to pay builders more." 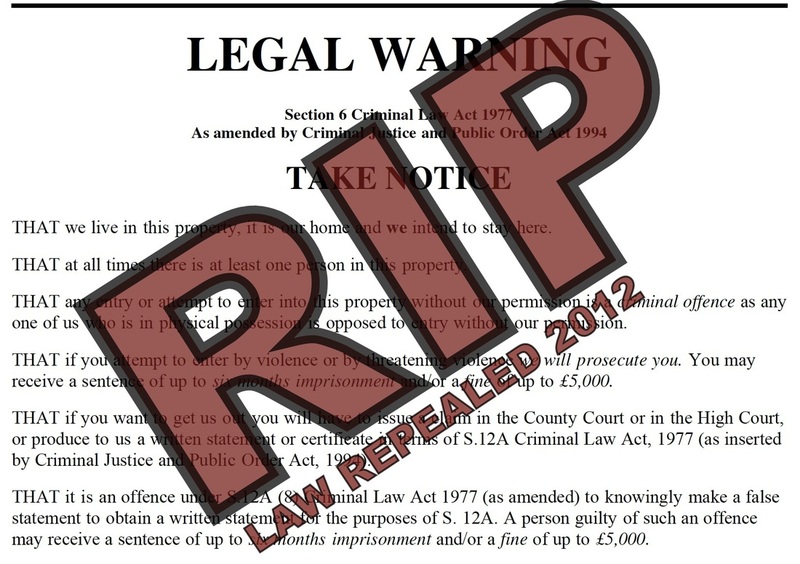 The new law has been criticised by some. Catherine Brogan, from the campaign group Squatters' Action for Secure Housing, told the BBC: "What we need is to tackle the housing crisis and not criminalise some of the most vulnerable people in our society." And Leslie Morphy, chief executive of the homeless charity Crisis, said the new measures "will do nothing to address the underlying reasons why vulnerable people squat in the first place - their homelessness and a lack of affordable housing". However, Justice minister Crispin Blunt said homelessness was at the lowest level for 28 years and the government was spending £400m on homelessness and £164m on bringing about 10,000 empty homes back into use. Chief Constable Phil Gormley, the Association of Chief Police Officers' lead on uniformed operations, welcomed the move saying police could "now act immediately and remove squatters directly from properties". Squatting is already illegal in Scotland, where the owner of a property has the right to eject squatters without serving notice or applying to a court for an eviction order. Squatters can face fines of up to £200. The new law was backed by the Labour Party. Shadow justice minister Andy Slaughter said: "Homeowners around the country are concerned about squatters and rightly want assurances from this Tory-led government that their properties will be protected. "The distress squatters can cause to families, as well as the financial damage they do, is completely unacceptable."